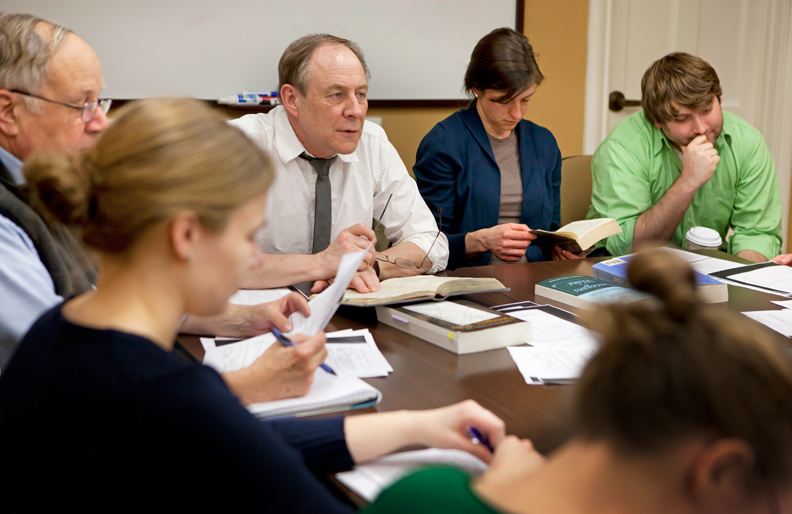 In 2005, English professor Joseph Nugent launched a reading group devoted to James Joyce’s final novel, the half-million-word, stream-of-consciousness Finnegans Wake (1939). Called “Raidin the Wake” (a nod to the Irish pronunciation of “reading” and to the work of invaders), the group of a dozen or more students, faculty, and friends meets weekly to savor and dissect “some dozen lines or two” of what Nugent terms “this notoriously complex work” that “makes use of every piece of knowledge you’ve ever collected.” On Saturday, April 16, the University will host a conference on James Joyce featuring Danis Rose, editor of the controversial 2010 edition of Finnegans Wake. Raidin the Wake (above) met at 10 Stone Avenue, home of the University’s Institute for the Liberal Arts, on March 30. In addition to Nugent (center, wearing tie) and Joyce fan Bruce Teague (to Nugent’s right), the week’s attendees included (clockwise from lower right), English master’s student Kerri Farrell (obscured), and English Ph.D. students Trista Doyle, Kelly Sullivan, and Andrew Kuhn. This feature was posted on Thursday, April 7, 2011 and is filed under Featured Photo.